A wonderous world of Footy's sub-culture! Footy books. I have hundreds of them. Sourced from op-shops, fetes and second hand book stores. I even shell out for the odd new book. My books don’t just sit their gathering dust either, I give them a good working over where possible. 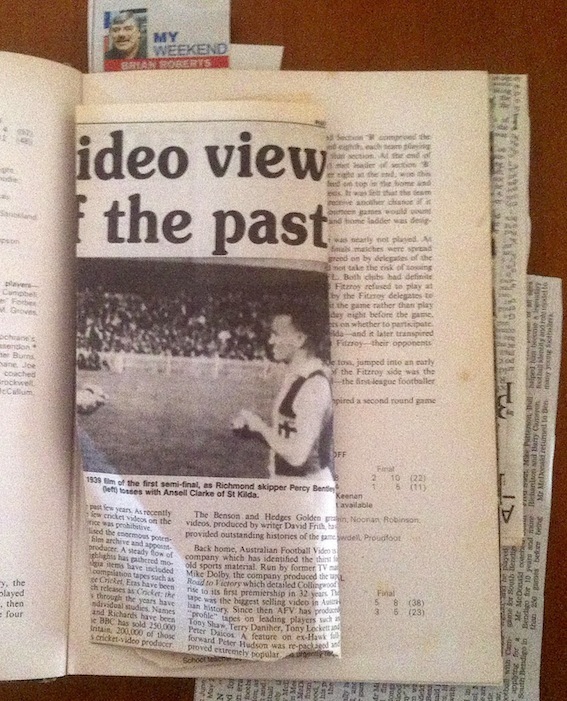 My love of both footy and its reading material stems back to my nana and pa’s house in Forest Hill. Old Richmondites, they ‘migrated’ like many from the suburb labelled ‘Struggletown’ to the south-east and finally eastern suburbs of Melbourne. Amongst books on gardening, Australian history and the odd Agatha Christie novel sat a clump of books on our great Australian game. I spent many hours poring over these books, and they have shaped my love of the game, it’s history, it’s social meaning, it’s sense of humour. 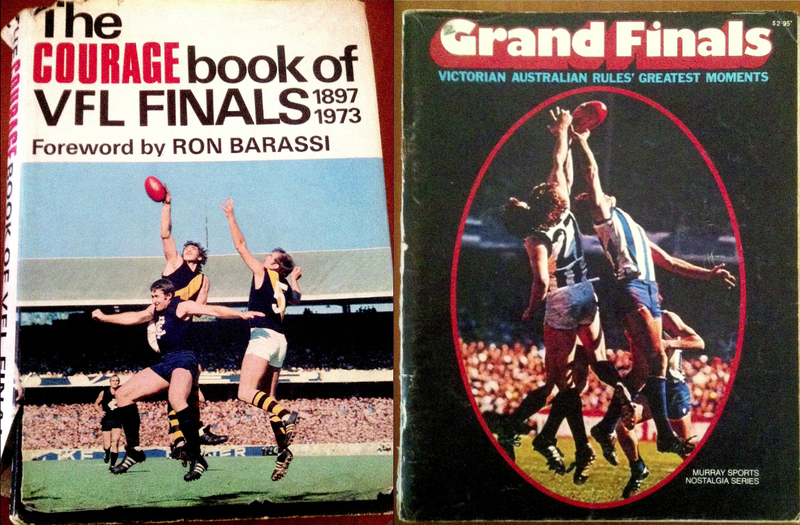 I’m going to focus this post on the two books which most captured my imagination; The Courage Book of VFL Finals-1897-1973 and Grand Finals, Victorian Australian Rules Greatest Moments. Both are similar in that they move chronologically through the history of the VFL, and I often read them in tandem. They say a picture tells a thousand words, and as a young boy, it was mostly the pictures I focussed on, along with the match details. As such I’m still yet to read much of the text! When my grandparents sadly passed, I snaffled the Courage book of Finals , and the below photo is a great memory I have of my nana. You could hardly touch one of her books without a plethora of related news clippings tumbling forth. 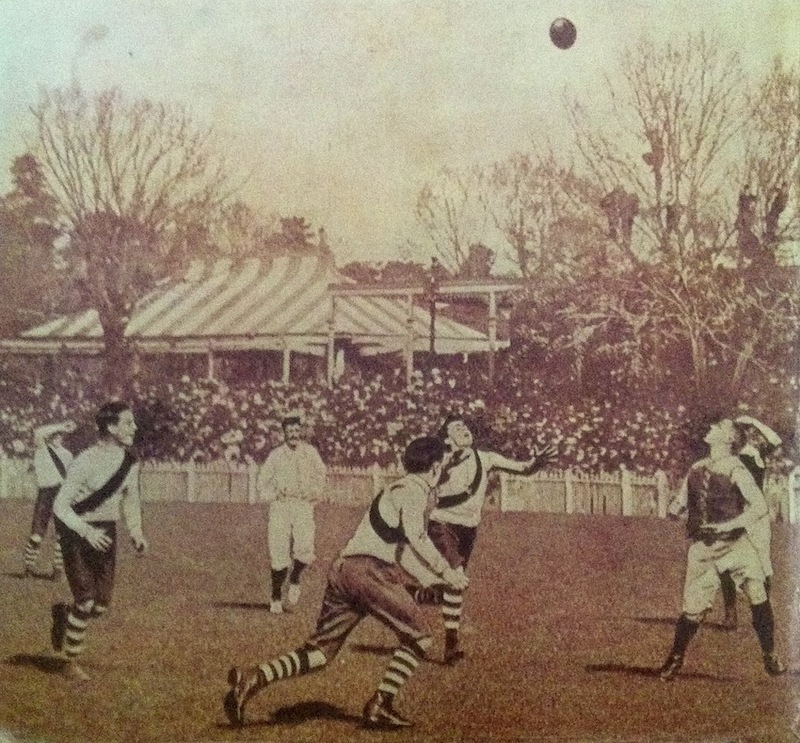 Below is a photo of the 1907 grand final between Carlton and South Melbourne which sits on the back cover of the book of finals, opposed to the ‘current’ image (1973) on the front. I looked at this photo endlessly as a boy, trying to comprehend just how the marquee styled pavilion and treed terraces was in fact the same MCG I grew up with, a concrete jungle. What strikes me is the carnival atmosphere this photo captures. People up trees to gain a better vantage point, trees which are positioned in front of the pavilion and grand stand, the warm September sun as Melbourne emerges from the depths of winter. What you’re looking at is in fact the precursor to the old and new Southern Stands. I’m still mesmerised by this photo. 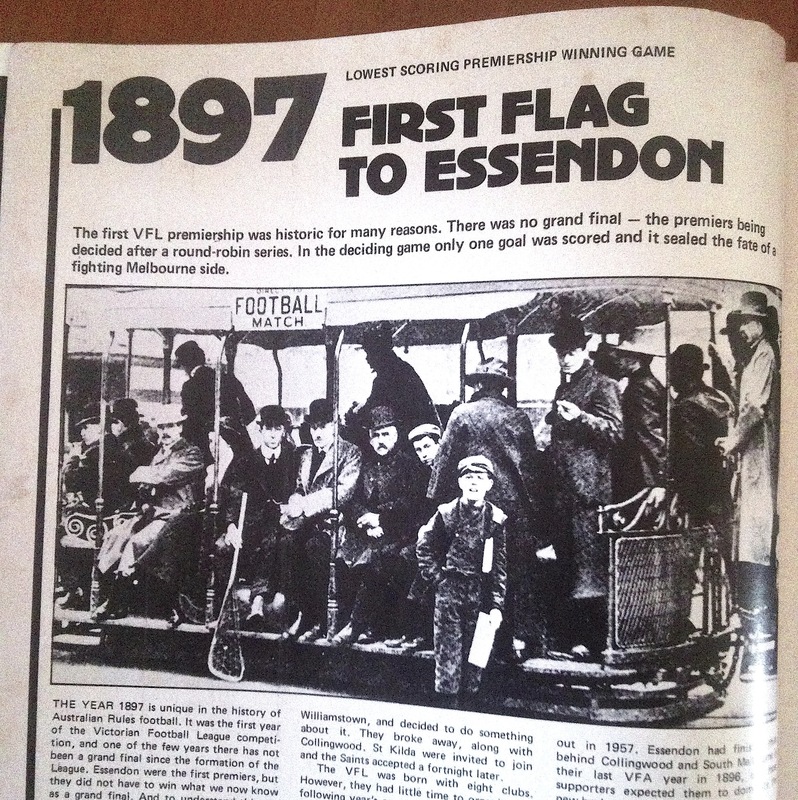 This photo of the packed footy tram is a classic, though not necessarily connected to Essendon’s 1897 flag. It says to me that as much as things change, they also stay the same. Stripped back, it’s a photo of football supporters on their way to the footy by tram. I did that myself a number of times last year. 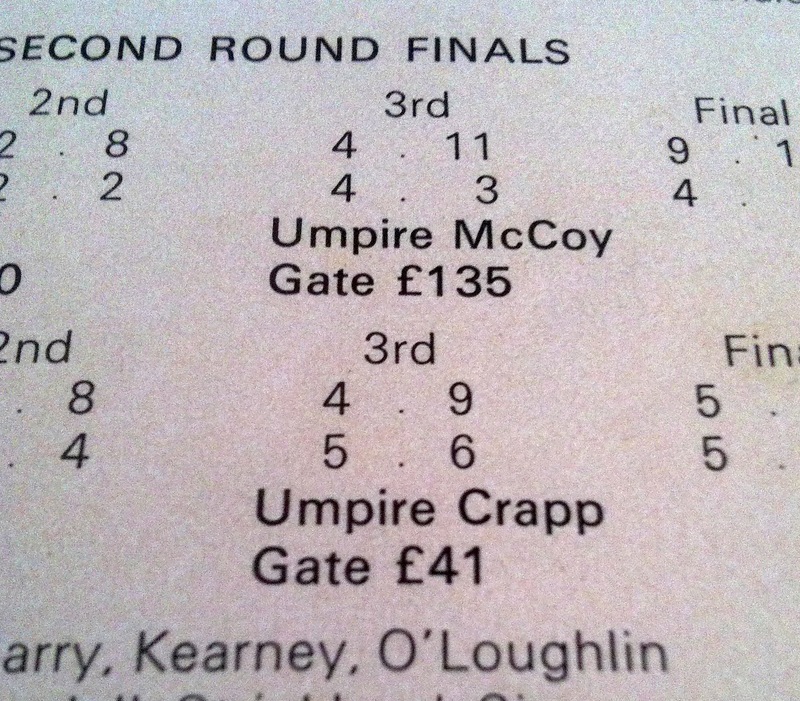 Something that of course made me snicker as a youngun’ was the fact that the bulk of early grand finals in the VFL were umpired by Ivo Crapp. Still raises a grin. To the untrained eye it may appear however to be a brief report on the days work by the man in white. From sifting through these old pictures, scores and words as an impressionable child, a deep impact has been made. 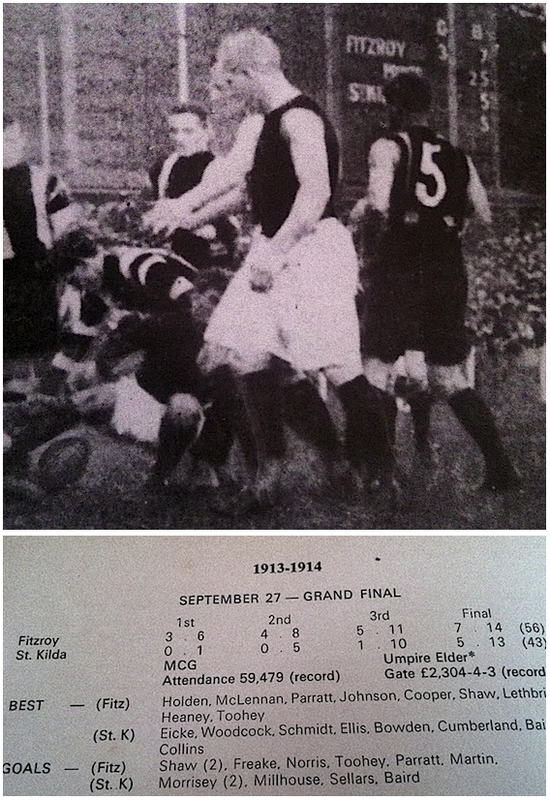 I was intrigued that Fitzroy was the early powerhouse of the VFL, was amazed that St.Kilda took years to actually register a single victory, and even more amazed that the two clubs played off the the 1913 grand final! How different things could have been had the Saints gotten up? The below photo also shows a great shot of the scoreboard which sat in the forward pocket a the punt road end of the MCG, not all too far from where the kids play up at the cricket these days. For more reading on the MCG scoreboards and 1913 grand final, these are some fantastic posts on the scoreboard pressure blog. As a young Tiger growing up in a Tiger household, I stopped often at the Richmond premiership years, and 1920 in particular. 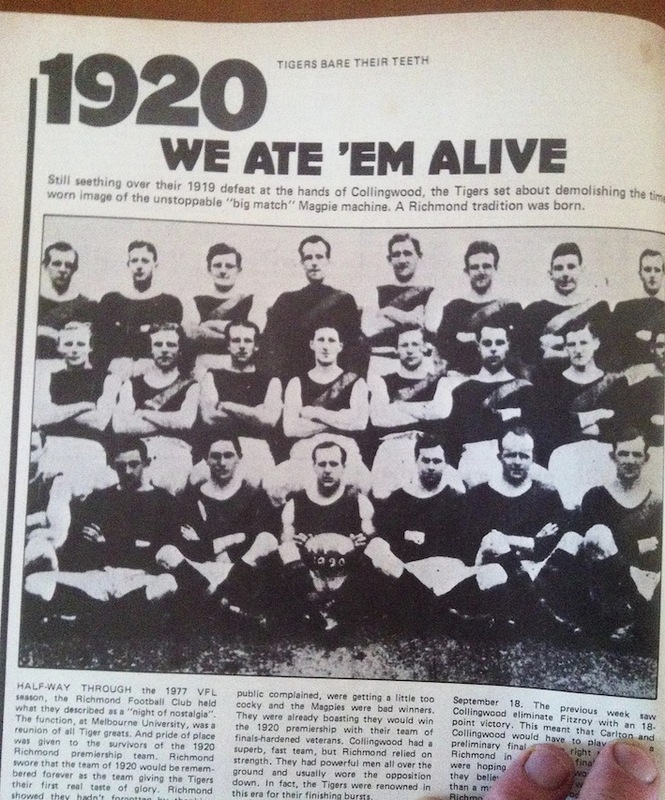 The phrase ‘We Ate ’em Alive’ was born after beating the hated rival Collingwood, who’d the previous year downed the Tiges in the big one. My nana still lived with a hatred for Collingwood born from the streets of Richmond, and as both my grandparents were born in 1920, I always found this page a bit special. A quick peruse of this site should quickly reveal that I have a thing for old footy grounds. Well much of that too can be traced back to hours spent trawling through these books, pouring over grainy old photos such as these. The photo on the left is of the Junction Oval on grand final day 1944, Fitzroy defeating the Tiges to claim their final league flag. It’s hard to spot them, but my grandparents, my nanas sisters and cousins, they’re all there. And why a grand final at the Junction Oval I hear you ask? Well the MCG was out of bounds, home to American and Australian troops amid World War 2. 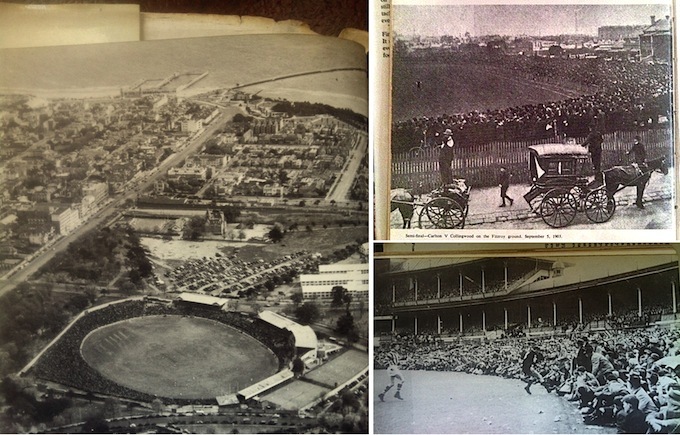 The photo in the top right corner takes us to Fitzroy’s Brunswick Street Oval for the 1903 semi-final between local rivals Carlton and Collingwood, at a time when the MCG wasn’t the assumed home of finals footy that it was soon to become. And below that is a wonderful still from the 1950 grand final between North and Essendon, another ‘forgotten’ grand final given North’s lack of success until the 1970’s. Imagine if Waverley Park could have seated people between the boundary and the fence!? Would have doubled the capacity! The composition of this photo always appealed to me, the fickle ball leading the players a merry dance as it tumbled this way and that. 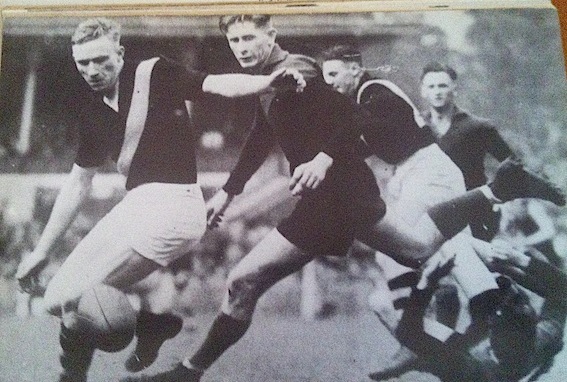 The Richmond player is Charlie Priestly, the Melbourne player more noted as a master coach, Norm Smith. Whenever the 1977 drawn grand final is mentioned, as it often is, the image in the top left hand corner is what comes to my mind first. The exhaustion and demoralisation is palpable, though it turns out simply to be Len Thompson receiving a 3 quarter time mouth wash, a fact I only realised as I read the caption for the first time yesterday! To the right of that is one of the most dramatic pictures in Australian football history. Essendon champion, John Coleman, tearily walking away from the tribunal a shattered young man, a four week suspension ending his 1951 final series before it began. Geelong defeated the Bombers by 11 points come grand final day, surely Coleman would have made the difference? We’ll never know. Below Coleman we find the old MCG fence, unable keep the bumper 1908 grand final crowd of 50,261 at bay. However it has lived to tell the tale. Between the two 50 metre arcs on the southern wing of the MCG, the very same 1884 boundary fence, with some slight modifications, still stands, making it clearly the oldest part of the MCG, not so closely followed by the 1985 fly-swat light towers. 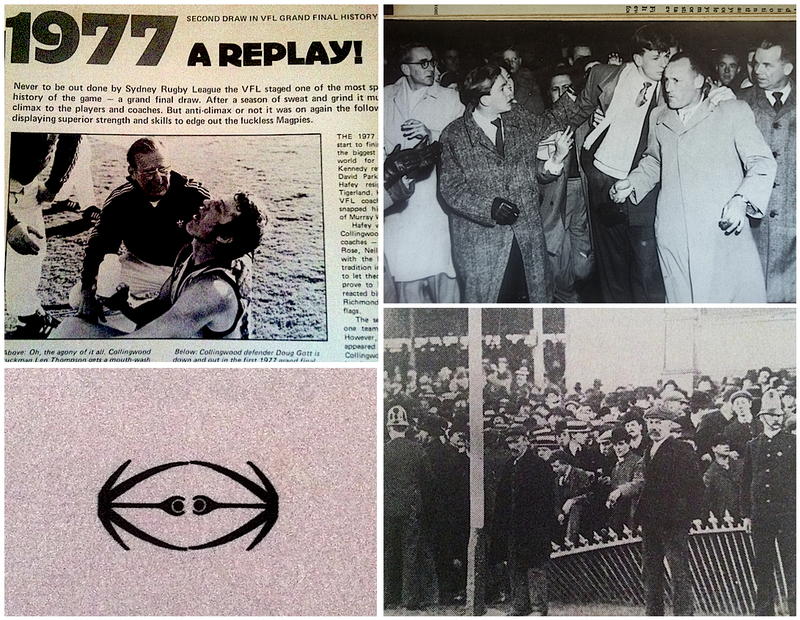 The photo on the left shows action from the Geelong v Collingwood grand final in 1937 in pretty much the same position that the 1907 Carlton v South photo was taken (above). The Southern stand was brand spanking new in 1937, and as you look through these books, the action suddenly becomes recognisable with the arrival of the grand stand, suddenly looking ‘modern’ compared with the treed MCG, the knickerbockers and numberless jumpers. To the right of that photo sees St.Kilda’s Bob Murray, taking what I see as the most graceful of marks in the 1966 grand final, while further right we see EJ the showman in the 1961 semi final against the Saints, triumphantly holding the ball aloft, giving the appearance that he’d just performed quite a feat to secure it. Finally, as the books were published mid 1970’s, the arrival of glossy coloured images filtered their way into the production. 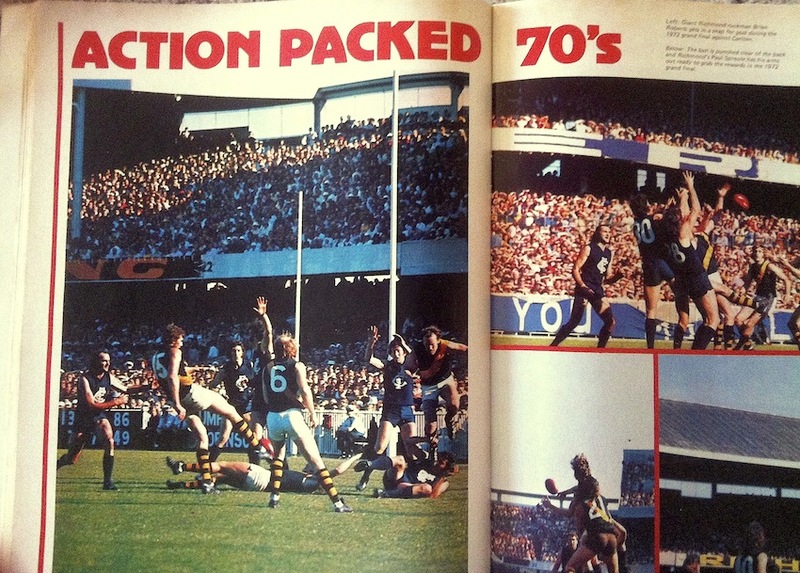 The book on Grand Finals comes complete with an ‘Action Packed 70’s’ colour section, wedged in between the years 1945 and 1946, akin to a Cleo sealed section. Again we see the characterful old Southern Stand, packed to the hilt, as Carlton and Richmond battled it out for the 1972 premiership. I hope you’ve enjoyed my trip down memory lane. You may even recall these books, or have more recent copies which were reprinted in later decades. While the old days of footy are at times difficult to connect with the game we know today, it’s good to know where footy has come from, that during the 1920’s, the 50’s or the 70’s, the game was always seen as we see it today, quicker and more skilled. We may look back on today’s football in 100 years with a nostalgic glance to a funny looking game they used to play on real grass! Who knows? The Courage book of VFL Finals may have come to a halt in 1973, but my father, in his early 20’s, utilised the several ‘Further Results’ pages at books rear, maintaining detailed finals results up until 1976, along with a cameo appearance from the 1980 grand final. This entry was posted in Boot's Library, Musings and tagged afl, books, Carlton, Collingwood, Courage, essendon, Footy, footy grounds, Forest Hill, Grand Finals, grandparents, Ivo Crapp, John Coleman, MCG, Melbourne, Norm Smith, Richmond, second hand, South Melbourne, sport books, st.kilda, Ted Whitten, tram, VFL by theholyboot. Bookmark the permalink. Great story H’boot. I too have a deep love for the Coleman pic. To me it resonates with the famous pic 12 years later of Jack Ruby shooting Lee Harvey Oswald. Someone somewhere has probably drawn up a conspiracy theory that connect the two. But the best pic here is your dad’s scores. Love it. Its Chris Rees also know as @4boat. I saw the Coleman pic in a recent book called Our Great Game. Caption said that shortly after this picture was taken “the impact of the rush of the large waiting crowd hurled Coleman against a traffic signal-box. He struck his head and collapsed on the pavement. He was eventually assisted into one of his friend’s cars.” For Grand Final week drama it’s right up there with Bob Pratt getting his foot run over by a truck full of bricks! As a Saint, my entrenched sigh rose as I saw your 1913 Grand Final pics. No wonder we have deep wounds, look how long we have struggled with only one cup! Five points at half time and 1.5 in the third, although we seemed to come back in the final quarter but didn’t get over the line. Apart from that, it was a brilliant read. Thanks John. I love that the 1913 wounds are still fresh! Much like my 1924 gripe about Essendon claiming the flag despite being beaten by Richmond in the final match! Keep the faith!!! How’s that full-forward line in the 75 GF: Blight, Wade, Cable. Heavenly. Go Roos! pleassant to read everthing at single place. 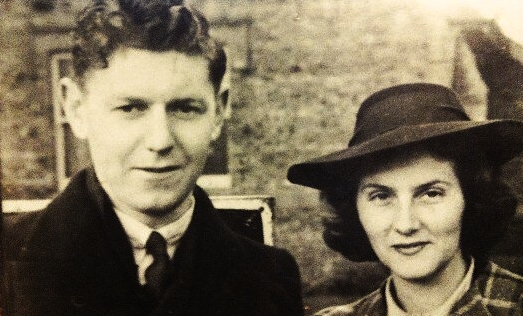 However (don’t you hate it when people say “however”), have to comment on the pic showing the great Norm Smith with – it is alleged – Charlie Priestley. That is not Priestley, it is Jack Cotter and the pic is from the 1940 semi-final, Melbourne v. Richmond, MCG Sept 14, 1940. This is not meant as a criticism but, as a Tiger supporter of many, many years, just like to set the record straight. Carry on the good work, I’ve had a lot of pleasure reading this site. Hi James and thanks for your kind words! I’m a stickler for details so I welcome comments such as this! Was purely going by what the old book of finals had as it’s caption for the image but these things are not always accurate! Let’s hope there’s a Tiger win this weekend!